In the language of reality TV, it’s time for the big reveal. Ladies and gentlemen — drum roll please — T-Mobile presents the first cell phone powered by Google’s much-ballyhooed mobile operating system, Android. Formal introductions will be made at 10 a.m. EST in New York. But, unlike the super-secret debut of Apple’s iPhone in June 2007, lots is known about the so-called Google phone even before its reveal. 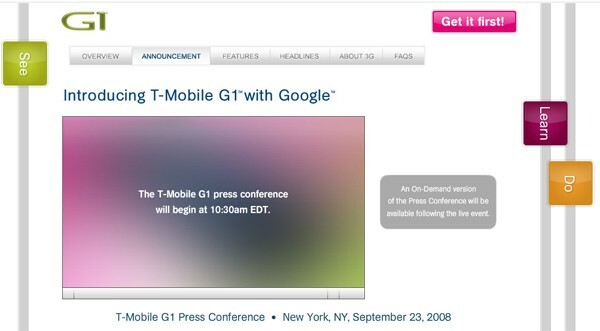 It will be known as the G1, but popular culture is sure to call it the first Google phone, gPhone, or Gphone. 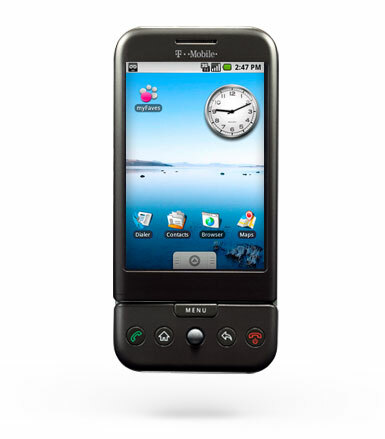 So, without further delay, here’s the Gphone brought to you by the carrier T-Mobile and hardware manufacturer HTC. No surprise here: The G1 will sell for $199 (the same as the iPhone) with a low-cost data plan (which remains to be detailed). According to TmoNews, the phone is 4.6 x 2.16 x 0.63 inches, weighs 5.6 ounces, an features a 480 x 320 HVGA display. Of course it uses the 3G network, has built-in GPS, has a 3.1-megapixel camera, has 8 GB of memory, has five hours of talktime and 130 hours of standby (we’ll see about that). Check out Engadget’s early gallery of G1 images. From these images, it is clear that T-Mobile and HTC went with the first phone they could fit Android into — the so-called HTC Dream. To be honest, the G1 looks like some other phone, not unique unto itself. Expect the Google App Store . . . oops . . . Market to be open as soon as phones are available (see Jeers below). From what we’ve seen so far, there will be lots of location-based apps (laws of average say at least a few of these will be cool and work well). Third-party apps might be a little more polished and less buggy than the ones that debuted on Apple’s App Store when iPhone 3G rolled out. Nobody cares about this other than phone geeks and developers: The Google platform is open, meaning it’s not locked down to a specific carrier’s specifications. Anybody can develop a Google phone app, no matter what T-Mobile itself wants. Average folks will certainly appreciate this, but to be truly open the Google phone will have to be on more than one carrier — T-Mobile, Verizon, AT&T, and Sprint in the U.S. It’s invigorating to think that you will be able buy the Google phone anywhere (carrier-specfic stores, Best Buy, mall kiosks) and use it on the network of your choice. Wonder how long this will take. And, as you might expect with anything branded as Google, the G1 should work exceptionally well with Google applications such as Gmail, Google Calendar, Maps, and all the other Google Web-based products. If you are heavily into Google, this may be the phone for you. The Google phone will be out in October, not today or the end of the week. It will not have Google Talk, Google’s chat engine. Bluetooth is expected to be crippled (for now). As Android is expected to be on lots of hardware (a stark contrast to Apple’s iPhone), carriers still have the right to configure Android to their liking — which may or may not be a good thing, depending on actual execution. Other Google phones are not expected to be available until early next year. And because these phones are not immediately available, nothing can be said about a consistent Android user experience between hardware and carriers. For all we know, this may not even be a big deal to consumers, who will buy the phone model that appeals to them and use it on the network of their choice. Big Brother, in this case Google, is watching. 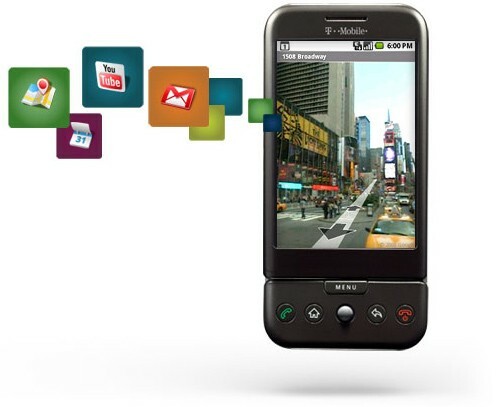 Some fear that using an all-Google phone gives the Big G too much entry into your mobile life. Expect to see contextualized local ads, which will make it feel like somebody is looking over your shoulder outside of Starbucks and Barnes & Noble. T-Mobile has gone live with its G1 Website, where you can get an overview of the G1, its features, and get in line to pre-order it. It’s availability is limited until the formal reveal. Fortune (via mocoNews.net) notes that T-Mobile is considering including free email access to Google’s Gmail service for Android phones, meaning users may not need a data plan. But remember, with free comes advertising. VentureBeat says the Android phone will have an Amazon music and video store application running (not unlike the App Store on the iPhone), allowing you to buy music but also to purchase and rent movies and video on the phone. And, just for good measure, now that we are on the threshold of the Google phone reveal, some are wondering what’s next for Google. The gPod? Google-run appliances, automotive? …this is random but i believe verizon’s getting first touchscreen blackberry, “storm”. and that’ll be out in a month or two itself. I like the 3.1 MP cameraphone….Though I think someone should really take the step and give us a 5 MP.